How far to the ice? Helga Bårdsdatter is a biologist living and working in Spitsbergen, one of Mission Blue's Arctic Hope Spots. 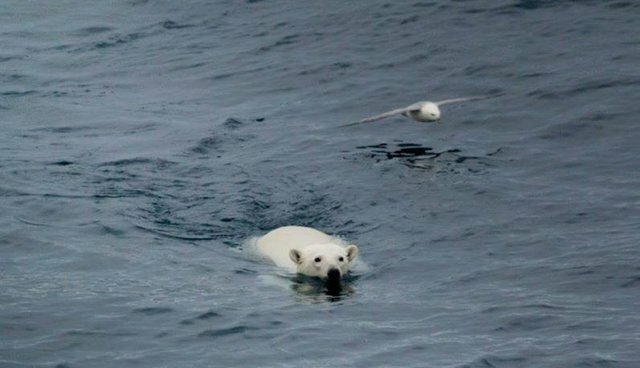 Last week, she shared this unforgettable photo of a polar bear swimming in open ocean, taken last August in an area usually covered with ice. Says Helga, "It was an emotional encounter with a polar bear in the middle of the ocean between the polar ice and Spitsbergen. We met this young polar bear on the swim at 81.40 degrees north. After a quick look at the sea ice map, we realized that she still had around 80 miles (130km) to swim before reaching the safety of the ice. They are known to swim great distances and it's said that they can smell the ice. But when we reached 82 degrees north there was no sign of ice. We had three days of near gale wind afterwards. If she is still out there swimming, reached the ice or if she didn't make it, I don't know. They live a tough life and it was a surreal and emotional glimpse of one individual's journey."